The microwave, mini-fridge and “Star Wars” poster may be no-brainers, but there’s one item that should give parents pause as they guide their high school grad out of the nest: the car. Even though your child has probably been driving unsupervised for a year or two already, taking a car to college may not be wise. Living away from home with a vehicle is a big responsibility and can have a major impact on your child’s safety, as well as your car insurance rates and overall finances. Here are some things to consider before giving your child the green light to cruise campus. From a safety standpoint, college students are better off not having a vehicle on campus, especially at first. Just a year or two of driving experience makes a big difference for young people. Per mile driven, teens are three times as likely to have fatal crashes as drivers 20 or older, according to the Insurance Institute for Highway Safety. And though your child may drive without incident at home, avoiding accidents could prove more difficult in a new environment. University roads can be hectic: According to the Census Bureau, college towns tend to have some of the highest concentrations of walking and biking commuters. Cyclists and pedestrians make formidable obstacles for drivers of any age, let alone teens who are trying to navigate unfamiliar territory. Assuming your child is on your car insurance policy, a crash he or she causes at college will come home to roost in the form of rate increases. NerdWallet found that annual rates for a couple with an 18-year-old increase by an average of $536 after an at-fault crash by the teen. 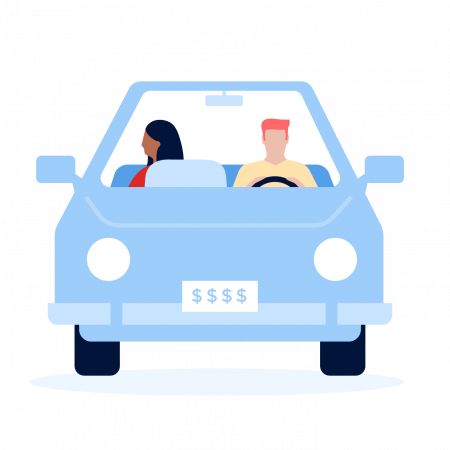 Even if your child steers clear of trouble, friends who borrow the car might not — and accidents caused by anyone driving your car can send your rates soaring at renewal time. It’s no secret that college campuses are flooded with alcohol and that students have little trouble finding it. With no parents in sight, many struggle to drink in moderation. Not exactly the best time to have a car at hand. In addition to the risk of injuring themselves or others, college students’ drinking and driving can cripple their parents financially. Here’s a rough estimate of how much a DUI conviction costs, according to NerdWallet research. How much does a DUI really cost? Even if you’re confident in your child’s judgment, the steep price for just one slip-up is a strong argument for holding onto the keys. Also keep in mind that this is a fairly conservative estimate. Costs could be even higher depending on your state, insurance company, the driver’s blood alcohol level at the time of the violation and other factors. Some car insurance companies offer extra savings to parents who send their children to college sans vehicle. The “student away at school” discount lets you save if your child attends school a certain distance from home, often 100 miles or more, and has access to your car only when he or she is visiting home. Several major insurers, including Liberty Mutual, State Farm and Travelers, offer this discount. Some parents may take comfort knowing their kids have a car on campus, making it easier to get around and visit home. But taking a vehicle to school brings some major headaches for students, too. For one thing, parking can be both scarce and expensive. Parking space is at such a premium, in fact, that some universities don’t allow freshmen to bring cars at all. There’s also the burden of giving rides to other students who don’t have a car and dealing with maintenance issues. Throw in the safety and financial concerns, and a bicycle or bus pass sound like pretty nice alternatives, or, if you’re feeling generous, an Uber stipend. Whatever you decide, it’s always a good idea to shop around for car insurance after a major life change, such as relocating a family member. Check out NerdWallet’s quote comparison tool to easily view rates. To estimate the car insurance increases after a DUI and an at-fault crash, we first tested a sample family’s rates with no accidents or violations. We did this by averaging the three lowest rates from the largest insurers across 10 ZIP codes in California, Florida and Illinois for a 47-year-old couple with an 18-year-old child. We then tested separately for both a DUI conviction at a blood alcohol content of between 0.12 and 0.16, and an at-fault crash causing $2,000 or more in damage. We averaged the price increases among all three states. Our test policy included 100/300/50 liability insurance limits, 100/300 uninsured motorist bodily injury coverage, collision and comprehensive with a $1,000 deductible, plus $10,000 personal injury protection in Florida only. Our test family had a 2012 Toyota Camry and a 2012 Ford Escape. These are sample rates generated through Quadrant Information Services. Your own rates will be different.